(Potential) Mistake Fare – Business TATL for $700??!! But it is for four tickets! Which means each ticket is roughly around ~$700USD! Of course you do this for one, two and three people, but the ticket is just more expensive per person. Keep in mind you must select 4 people as well as the third flight. From the time I’ve played around with it, I’ve been able to get a priceline itinerary number which shows up, except the tickets just haven’t been issued. It also seems the seats get removed from inventory (or held somehow?) as when open a new incognito window and search with the same dates, the same flights either do not exist or are significantly more expensive (which I would assume the seats have been taken out of the cheaper fare buckets). 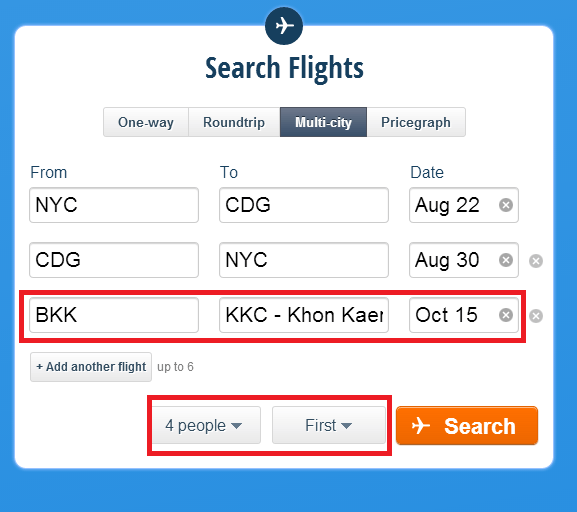 You also have to click through to hipmunk and then to priceline. Doing the same itinerary on priceline hasn’t worked for me. As I said, I haven’t been able to ticket. It definitely could be a strange glitch. But I know (some) readers here like to experiment so if you have time play around with it for a bit. Who knows, you could be able to ticket! Big HT to Roland who sent me this! That is a good question! I would think it would be based on the fare rules, but you can’t see them. I would say that if (you can!) book, there is a good chance that priceline will offer to refund your itin as clearly it is an erroneous fare. There is a I think a DOT rule that allows free holds or cancellations within 24 hours of purchase (http://consumerist.com/2012/10/24/some-airlines-make-it-awfully-tricky-for-passengers-to-get-refund-within-24-hours-of-buying-a-ticket/) so definitely check your rules and regulations if you have an intention of cancelling. I think the 24-hour policy only applies to the airfare. The service charge/processing fee might not be refundable. That’s been the case for me too, unfortunately. What dates/routes did you try? Hm…. to be honest I have no idea why it won’t ticket. As I said I tried several times yesterday and it didn’t work either so I was hoping someone would make it work. As I said in the post, I’m not sure that it’s actually ticketable so I’d post to see if you readers could. Sorry for disappointing you! not working!!!!!!! Wasted 1.5 hours. LOL. It was fun though. Thanks for posting this btw. I admire how you’re willing to share, albeit a bit late. Better than most bloggers in here though. Thank you for your kind words. How am I a little late though? I did some search and I found that you can set your departure anywhere you want,like PEK/PVG/HKG and so on. Especially HKG,the fare is about 400-600 USD per ticket!That’s good!!!! 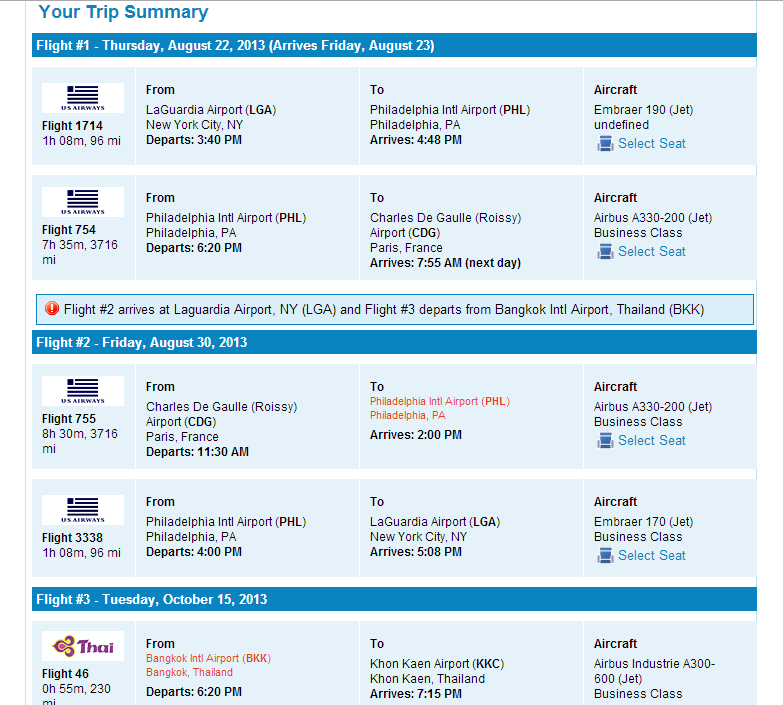 Also,in my search reslut,NYC-CDG,CDG-NYC,BKK-KKC,ONLY 606.26 USD per ticket. 3.U may have to clean your IE(or other browser)’s cookies when you start another search. Did anyone manage to purchase the tickets ? Not neccesary CDG. I tried BUE BKK NYC // BOS BUE ttl USD 4980 x 4 tickets. Could be a open jaw mistake. I didnt try, not enough credit card limit. I tried something like YVR-CDG, CDG-LHR, MUC-YVR and it priced correctly. Not sure how you’re getting it to work. Try with EK and via BKK. I tried BKK with BA and didnt work. Sure, I believe you! Just too hard to position there for me to make the fare work. All in economy though. Too many flights in Y! Jeff, has matias been able to ticket this from BKK? I’m not sure, he never replied.